“In the Garden” is a picture painted by Renoir in 1885 and currently in the collection of the State Hermitage Museum in St. Petersburg. Made in oil on canvas of relatively large size. For a long time this work was almost unknown to the public and was not exhibited not only in the exposition of museums, but did not even appear at exhibitions. 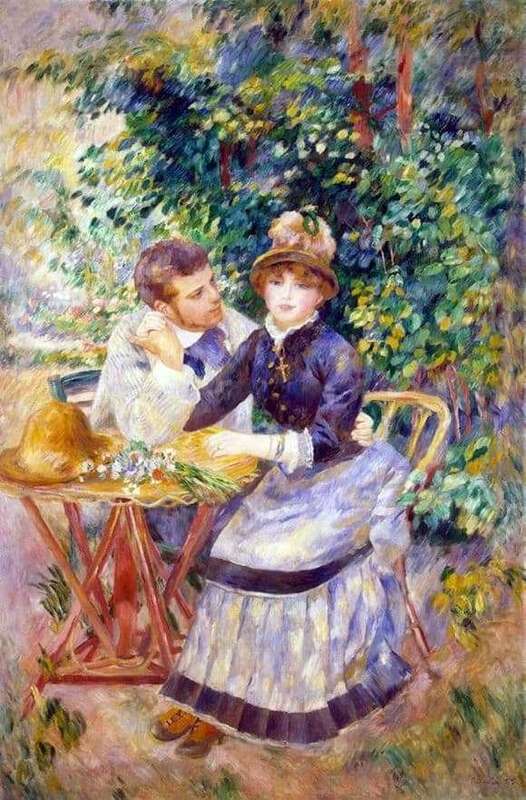 Contrary to the Impressionist rule, Renoir gives the plot detail, but does not turn the picture into an exclusively genre and skillfully avoids sentimentalism and the absence of any taste that the impressionists have seen in most genre works. Renoir was one of the main and significant representatives of the impressionist movement in France. Master of portrait, images of high society scenes and light, aerial landscapes. Favorite of the public, Renoir conquers the audience with the charm of his characters and a pleasant eye with color. Although at first he was an ardent supporter of the Impressionists and an “admirer of impression”, by the end of the 19th century he returned to the classics and abandoned his successful early works. Renoir’s paintings often depict sentimental heroes. Couples of lovers, dancing people – the artist loves the feeling and movement, lightness and bright emotions. “In the garden” is just such a work. The couple depicted on the canvas are not random heroes. The young man, dressed in a light suit, holds the girl by the hand and his gaze is questioningly directed at her beautiful face, and the second hand embraces the waist. The lady, in turn, looks at the viewer. Her summer dress, a lying bouquet of flowers, surrounding greens and colors all give a charming and romantic mood. The young man makes an offer, and the girl is considering a decision that he is about to make. It is known that his friend posed for the young man Renoir, and the girl was also well acquainted with the artist.